This is an opinion prepared for the Criminal Law Committee of the Law Society of Singapore on an arrested person’s right to legal counsel in Singapore. Specifically, it deals with the following: (1) it summarizes pertinent aspects of the law relating to the right to legal counsel in Singapore; (2) it surveys a number of ASEAN and Commonwealth jurisdictions to determine how long after apprehension the right to counsel is generally accorded to arrested persons, and compares the legal position in these jurisdictions to the situation in Singapore; and (3) it examines two rights ancillary to the right to legal counsel, namely, the right to be informed of the right to counsel, and the right to inform third parties such as family or friends of one’s arrest. This document may also be obtained from the Social Sciences Research Network. Jack Tsen-Ta Lee. 19 April 2012. 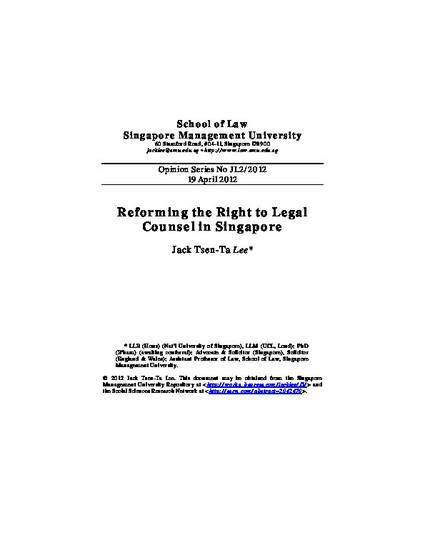 Reforming the Right to Legal Counsel in Singapore. Singapore Management University School of Law Opinion Series No JL2/2012. Available at: http://works.bepress.com/jacklee/15.